I have this nagging interest in the literature of British writers in the post-war years of London and other cities in the United Kingdom. Keith Waterhouse is one of the writers that I kept a note of, to investigate, especially his novel "Billy Liar," which of this date, I haven't read yet. By chance, I picked up this edition published by The British Library of two Waterhouse memoirs in one volume "City Lights" & Streets Ahead." Both are remarkable books, not due to originality, but the fact that Waterhouse was a remarkable memoirist, who not only captured various characters that came and went in his life but more important to me, places. 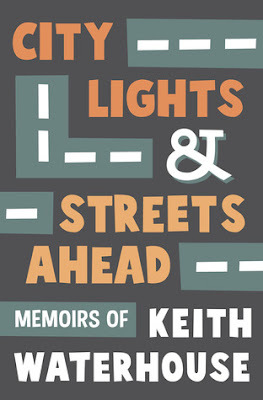 I wouldn't think he would call himself a Situationist, but he shares the love of exploration of one's neighborhood, town, and city and with great descriptive powers of his writing, he captures neighborhoods better than a photograph of such a place. "City Lights" is about his youth in Leeds during the war years, and also his first approach to becoming a journalist for newspapers. Waterhouse has a perfect pitch understanding of the importance of location in everything he writes about. This is something he must have learned as a journalist, or, he has that natural talent in expressing the surroundings in such a vibrant, textural manner of writing. He's obsessed with the markets, bus & public transportation, libraries, marketplaces, and so forth. How a city is built up and serves its population is very much on Waterhouse's mind. The beauty of the writing is not just a factual set of information, but his subjectivity due to his writing that puts explicit images in the reader's head. Toward the end of the book, he and Hall worked for the Rolling Stones, on a film project that didn't happen. It's interesting to read commentary by a guy from the theater London world commenting on The Stones world in Los Angeles and a bit of London. "City Lights & Streets Ahead" is a British must read for those who are fascinated with England in the 1950s -especially regarding its Theater life.